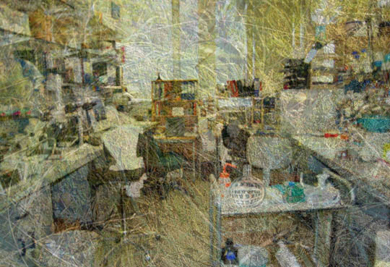 Laboratory Life brings together the scientist’s laboratory and the artist’s studio. As an ode to what was once a nature/culture divide, this image moves back and forth, recording the ways nature and culture intersect. The laboratory pictured here is located at the European Molecular Biology Laboratory, near Rome, Italy. The superimposed image of grass, taken in East Hampton, NY, denotes the ever changing cycle of renewal in the natural world. Combining these images by layering techniques, the final read-out creates an atmosphere in which aesthetic devices underscore embedded aspects of reason within the scientific realm. Here the ebb and flow of contemplation, recognition, and unpredictable revelation engage both the scientist and the artist in their ambitions directed towards the ambiguities of life and the powers of discovery. Suzanne Anker, who served as moderator for the online symposium, is a visual artist and theorist working with genetic imagery. She is the coauthor of “The Molecular Gaze: Art in the Genetic Age” (Cold Spring Harbor Laboratory Press, 2004). She curated “Gene Culture: Molecular Metaphor in Contemporary Art” (Fordham University, 1994), the first exhibition devoted entirely to the intersection of art and genetics. Anker teaches art history and theory at the School of Visual Arts, New York.